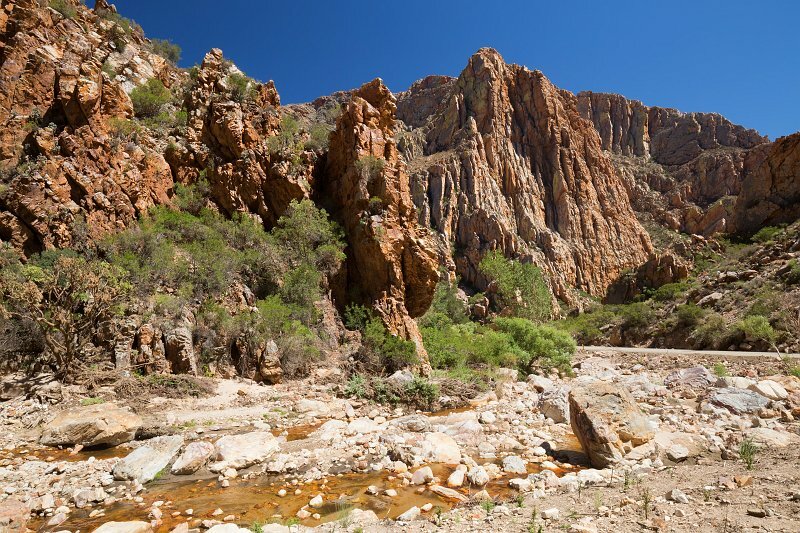 The Swartberg mountains are amongst the best exposed fold mountain chains in the world, and the pass slices through magnificently scenic geological formations. The contortions in the rock display astonishing anticlines and synclines, and the vivid coloration of the surrounding Quartzite is remarkable. The pass is especially known for the unusual geology that is exposed at its Northern end. Here, seven-hundred-metre-high quartzite cliffs of the upper Table Mountain Group can be seen, and these are often tilted through 90 degrees (sometimes even more). Arguably the most famous of all these cliff faces is the spectacular 'Wall of Fire'.